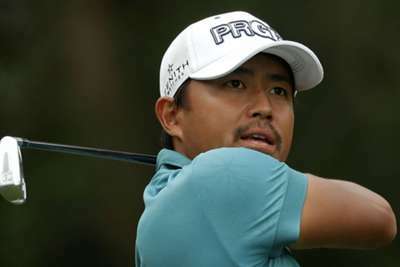 Satoshi Kodaira stormed from five shots off the lead to claim his first PGA Tour victory by defeating Kim Si-woo in a play-off at the RBC Heritage. Kodaira, 28, capitalised on Kim's wayward putting down the stretch after three extra holes, while overnight leader Ian Poulter slid down to seventh. Kim failed to sink putts from eight feet or less on his last four holes, including one from seven feet for a birdie at the last that would have won him the title. The leading duo could not be separated after playing the 18th another two times, but Kodaira birdied the par-three 17th to take the glory. Satoshi Kodaira started Sunday five back, seeking the miraculous. The Japanese carded a five-under 66 to surge up the leaderboard, aided by Poulter enduring a miserable back nine that saw him drop shots on five holes and finish with a four-over 75. Poulter ended a six-year wait for a title at the Houston Open this month, a victory that earned him a place at the Masters, and he will be irked not to have doubled his tally in April. Bryson DeChambeau bounced back from his woeful Saturday by matching Kodaira's round, a run of four birdies to finish sending him level with Luke List in third, one shot adrift of top spot. World number one Dustin Johnson produced his best round of the weekend – a four-under 67 – but it was too little too late as he settled for a share of 16th.